WASHINGTON, DC, November 1, 2011 (ENS) – The oceans advocacy group Oceana is suing the National Marine Fisheries Service based on the agency’s alleged failure to account for the catch of non-target fish and ocean wildlife in setting catch limits for Mid-Atlantic fisheries. Oceana is asking the court to overturn the Omnibus Annual Catch Limit Amendment to the Magnuson-Stevens Act, approved earlier this year, which sets rules for fisheries from New York to North Carolina. The amendment was originally intended to set scientifically-based annual catch limits and accountability measures for all 13 fish species managed in the region. But Oceana says the amendment falls far short of its goal. “The Magnuson-Stevens Act, the law governing U.S. commercial fisheries, requires National Marine Fisheries Service to set limits on the number of fish caught regardless of whether or not the species is a target of the fishermen,” said Gib Brogan, Northeast representative for Oceana. National Marine Fisheries Service recently released its first U.S. National Bycatch Report, which shows that bycatch is rampant in the Mid-Atlantic. In general, the fisheries with the highest bycatch ratios were bottom trawl and bottom longline fisheries, the report states. In the Mid-Atlantic trawl fishery, for instance, one pound of non-target fish is caught for every three pounds of fish being brought to shore. “This bycatch is often thrown overboard, dead or dying and includes species that are specifically targeted by fishermen in other federal or state managed fisheries,” Oceana said in a statement. The organization contends that fishery managers are failing to take into account the fish that are caught in multiple fisheries as target catch and bycatch. And it’s not just fish bycatch that is a problem. The U.S. National Bycatch Report cites a 2009 study estimating that up to 3,187 marine mammals are caught annually for the period 1990-99. 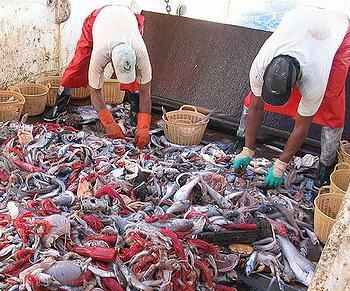 The NMFS’s own estimate is 1,887 animals die annually in nets as bycatch.